White nationalism is an ideology that advocates a racial definition of national identity. Proponents of the ideology identify with and are attached to the concept of a white nation. It ranges from a preference for one's specific white ethnic group, to feelings of superiority, including calls for national citizenship to be reserved for white people. White separatism and white supremacy are subgroups of white nationalism. Separatists seek a white-only state, while supremacists add ideas from social Darwinism and Nazism to their ideology. Both subgroups generally avoid the term supremacy because it has negative connotations. Critics have argued that ideas such as white pride and white nationalism exist to provide a sanitized public face for white supremacy, and that most white nationalist groups promote racial violence. White nationalists argue that every nationality feels a natural affection for its own kind. They advocate racial self-preservation and claim that culture is a product of race. According to white nationalist Samuel T. Francis, it is "a movement that rejects equality as an ideal and insists on an enduring core of human nature transmitted by heredity." Jared Taylor, a white nationalist, claims that similar racial views were held by many mainstream American leaders before the 1950s. According to Samuel P. Huntington, white nationalists argue that the demographic shift in the United States towards non-whites brings a new culture that is intellectually and morally inferior. They argue that with this demographic shift comes affirmative action, immigrant ghettos and declining educational standards. Most American white nationalists say immigration should be restricted to people of European ancestry. Most white nationalists define white people in a restricted way. In the United States, it often—though not exclusively—implies European ancestry of non-Jewish descent; one example is the U.S. National Socialist Movement, which stipulates that "Party Membership is open to non-Semitic heterosexuals of European descent." Some white nationalists draw on 19th-century racial taxonomy. Some white nationalists, such as Jared Taylor, have argued that Jews can be considered "white". Though many white nationalists oppose Israel and Zionism, several white nationalists, such as William Daniel Johnson and Jared Taylor, have expressed support for Israel and have drawn parallels between their ideology and Zionism. Different racial theories, such as Nordicism and Germanism, define different groups as white, both excluding some southern and eastern Europeans because of a perceived racial taint. Pan-Aryanism defines whites as individuals native to Europe, the Americas, Australia, New Zealand, South Africa, and Western Asia who are wholly of Caucasian lineage or are overwhelmingly from the following Caucasian ethnic groups, or any combination thereof: Indo-European ("Aryan," including the Iranian and Indo-Aryan peoples), Old European (e.g. Basque), or Hamitic (in modern times supposedly confined to Berbers). The Thule Society developed out of the "Germanic Order" in 1918, and those who wanted to join the Order in 1917 had to sign a special "blood declaration of faith" concerning their lineage: "The signer hereby swears to the best of his knowledge and belief that no Jewish or coloured blood flows in either his or in his wife's veins, and that among their ancestors are no members of the coloured races." Heinrich Himmler, one of the main perpetrators of the Holocaust, said in a speech in 1937: "The next decades do in fact not mean some struggle of foreign politics which Germany can overcome or not ... but a question of to be or not to be for the white race ... ." As the Nazi ideologist Alfred Rosenberg said on the 29th of May 1938 on the Steckelburg in Schlüchtern: "It is however certain that all of us share the fate of Europe, and that we shall regard this common fate as an obligation, because in the end the very existence of White people depends on the unity of the European continent." At the same time Nazis subdivided white people into groups, viewing the Nordics as the "master race" (Herrenvolk) above groups like Alpine and Mediterranean peoples. Slavic peoples, such as Russians and Poles, were considered Untermenschen instead of Aryan. Hitler's conception of the Aryan Herrenvolk ("Aryan master race") explicitly excluded the vast majority of Slavs, regarding the Slavs as having dangerous Jewish and Asiatic influences. The Nazis because of this declared Slavs to be untermenschen (subhumans). Hitler described Slavs as "a mass of born slaves who feel the need of a master". Hitler declared that because Slavs were subhumans that the Geneva Conventions were not applicable to them, and German soldiers in World War II were thus permitted to ignore the Geneva Conventions in regard to Slavs. Hitler called Slavs "a rabbit family" meaning they were intrinsically idle and disorganized. Nazi Germany's propaganda minister Joseph Goebbels had media speak of Slavs as primitive animals whom were from the Siberian tundra who were like a "dark wave of filth". The Nazi notion of Slavs being inferior was part of the agenda for creating Lebensraum ("living space") for Germans and other Germanic people in eastern Europe that was initiated during World War II under Generalplan Ost, millions of Germans and other Germanic settlers would be moved into conquered territories of Eastern Europe, while the original Slavic inhabitants were to be exterminated and enslaved. Nazi Germany's ally the Independent State of Croatia rejected the common conception that Croats were primarily a Slavic people and claimed that Croats were primarily the descendents of the Germanic Goths. However the Nazi regime continued to classify Croats as "subhuman" in spite of the alliance. Even among European cultures and people that were considered Aryan, the Nazis considered the Nordic race and German culture to be superior to other Aryan races and cultures, thus making them far less Pan-European than groups that identify themselves as White Nationalist. Throughout the 19th and early 20th centuries, racial definitions of the American nation were still common, resulting in race-specific immigration restrictions, such as the Chinese Exclusion Act. This particular brand of American nativism allowed even more recent European newcomers, such as the Irish, to unite with founding-stock white Americans to halt non-European immigration. Groups such as the Asiatic Exclusion League, formed on 14 May 1905 in San Francisco, California by 67 labor unions and supported by labor leaders (and European immigrants) Patrick Henry McCarthy of the Building Trades Council of San Francisco, Andrew Furuseth and Walter McCarthy of the Sailor's Union, attempted to influence legislation restricting Asian immigration. 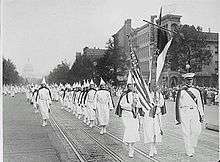 Following the defeat of the Confederate States of America, the Ku Klux Klan (KKK) was founded as an insurgent group with the goal of maintaining the Southern racial system throughout the Reconstruction Era. Although the first incarnation of the KKK was focused on maintaining the Antebellum South, its second incarnation in the 1915-1940s period was much more oriented towards white nationalism and American nativism, with slogans such as "One Hundred Percent Americanism" and "America for Americans", in which "Americans" were understood to be white and Protestant. 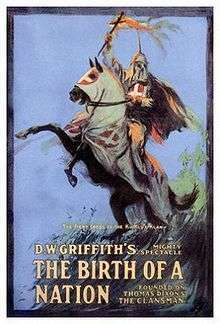 The 1915 film The Birth of a Nation is an example of an allegorical invocation of white nationalism during this time, and its positive portrayal of the first KKK is considered to be one of the factors which led to the emergence of the second KKK. Starting in the 1960s, white nationalism grew in the US as the conservative movement developed in mainstream society. Samuel P. Huntington argues that it developed as a reaction to a perceived decline in the essence of American identity as European, Anglo-Protestant and English-speaking. One of the most influential white nationalists in the United States was Dr. William Luther Pierce, who founded the National Alliance in 1974. During the 1980s the United States also saw an increase in the number of neo-völkisch movements. According to Nicholas Goodrick-Clarke, these movements cover a wide variety of mutually influencing groups of a radically ethnocentric character which have emerged, especially in the English-speaking world, since World War II. These loose networks revive or imitate the völkisch movement of 19th and early 20th century Germany in their defensive affirmation of white identity against modernity, liberalism, immigration, multiracialism, and multiculturalism. Some are neo-fascist, neo-Nazi or Third Positionist; others are politicised around some form of white ethnic nationalism or identity politics, and a few have national anarchist tendencies. One example is the neo-tribalist paganism promoted by Else Christensen's Odinist Fellowship Especially notable is the prevalence of devotional forms and esoteric themes, so neo-völkisch currents often have the character of new religious movements. More recently, the Alt-right, a broad term covering many different far-right ideologies and groups in the United States, some of which endorse white nationalism, has gained traction as an alternative to mainstream conservatism in its national politics. Carol M. Swain argues that the unstated goal of white nationalism is to appeal to a larger audience, and that most white nationalist groups promote white separatism and racial violence. Opponents accuse white nationalists of hatred, racial bigotry and destructive identity politics. White supremacist groups have a history of perpetrating hate crimes, particularly against people of Jewish or African descent. Examples include the lynching of black people by the Ku Klux Klan (KKK). ↑ Conversi, Daniele (July 2004). "Can nationalism studies and ethnic/racial studies be brought together?". Journal of Ethnic and Migration Studies. Taylor and Francis. 30 (4): 815–29. doi:10.1080/13691830410001699649. ↑ Rothì, Despina M.; Lyons, Evanthia; Chryssochoou, Xenia (February 2005). "National attachment and patriotism in a European nation: a British study". Political Psychology. Wiley. 26 (1): 135–55. doi:10.1111/j.1467-9221.2005.00412.x. In this paper, nationalism is termed "identity content" and patriotism "relational orientation". ↑ FBI Counterterrorism Division (13 December 2006). State of domestic white nationalist extremist movement in the United States. FBI Intelligence Assessment. ↑ Loftis, Susanne (April 11, 2003). "Interviews offer unprecedented look into the world and words of the new white nationalism". Vanderbilt News. Vanderbilt University. ↑ Zeskind, Leonard (November 2005). "The New Nativism: The alarming overlap between white nationalists and mainstream anti-immigrant forces". The American Prospect. The American Prospect, Inc. 16 (11). 1 2 "White nationalists seek respectability in meeting of 'Uptown Bad Guys'". Newhouse News Service. April 4, 2000. ↑ Zeskind, Leonard (2009), "Prolegomena to the future, 2001–2004", in Zeskind, Leonard, Blood and politics: the history of the white nationalist movement from the margins to the mainstream, New York: Farrar, Straus and Giroux, p. 526, ISBN 9780374109035. ↑ Schumaker, Paul (2008), "Questions of citizenship", in Schumaker, Paul, From ideologies to public philosophies: an introduction to political theory, Malden, Massachusetts: Blackwell Publishing, p. 254, ISBN 9781405168359. ↑ Crowe, Paul (2009), "Daoist heritage today", in Clarke, Peter B.; Beyer, Peter, The world's religions: continuities and transformations, London New York: Taylor & Francis, pp. 129–34, ISBN 9780415397254, A competing atheistic or panthestic white racist movement also appeared, which included the Church of the Creator/ Creativity Preview. ↑ "NSM Application Packet" (PDF). National Socialist Movement. Archived from the original (PDF) on 21 May 2013. Retrieved 20 August 2013. ↑ Potok, Mark; Beirich, Heidi (Summer 2006). "Schism Threatens White Nationalist Group". Intelligence Report. Retrieved July 20, 2010. ↑ Greenberg, Brad A. (May 29, 2008). "Racism colors judicial bid: Candidate Bill Johnson advocates deportation of 'non-whites'". The Jewish Journal of Greater Los Angeles. TRIBE Media Corp.
↑ Sheen, David. "American White separatist finds shared values with Israel". muftah.org. Muftah. ↑ "Refuting racial myths (RRM)". 1 2 "Policy Launch Speech: Stanley Bruce, Prime Minister" (PDF). Melbourne: The Age. 26 October 1925. p. 11. Archived from the original (PDF) on 2006. Retrieved 24 January 2008. ↑ Bowen, James; Bowen, Margarita (2002), "Origin stories and political economy, 1740–1870", in Bowen, James; Bowen, Margarita, The Great Barrier Reef: history, science, heritage, Cambridge, UK New York: Cambridge University Press, p. 301, ISBN 9781280162640. Preview. ↑ "Abolition of the 'White Australia' Policy". Australian Department of Immigration. Archived from the original on 1 September 2006. Retrieved 14 June 2006. ↑ "Chinese Immigration Act 1885, c. 71". asian.ca. Asian Canadian – Law Centre. July 20, 1855. ↑ Vancouver News-Advertiser, 7 September 1907. ↑ "Die nächsten Jahrzehnte bedeuten nicht etwa irgendeine Auseinandersetzung außenpolitischer Art, die Deutschland bestehen kann oder nicht bestehen kann, sondern ... sie bedeuten das Sein oder Nichtsein des weißen Menschen, ... .", Sammelheft ausgewählter Vorträge und Reden (Collection of chosen Talks and Speeches), Franz Eher Nachfolger (main Nazi publishing house), Berlin, 1939, p. 145, "Wesen und Aufgabe der SS und der Polizei, 1937" (Nature and Purpose of the SS and the Police, 1937). ↑ Mineau, André (2004). "The conceptualization of ideology". In Mineau, André. Operation Barbarossa: ideology and ethics against human dignity. Amsterdam New York: Rodopi. pp. 34–36. ISBN 9789042016330. ↑ Thorne, Steve (2006), "Us and them", in Thorne, Steve, The language of war, London New York: Routledge, p. 38, ISBN 9780203006597. ↑ Perry, Marvin (2001), "The era of totalitarianism", in Perry, Marvin, Western civilization: a brief history (10th ed. ), Boston, Massachusetts: Houghton Mifflin, p. 468, ISBN 9781111837198. ↑ Nelson, Anne (2009), "Other worlds", in Nelson, Anne, Red Orchestra: the story of the Berlin underground and the circle of friends who resisted Hitler, New York: Random House, p. 212, ISBN 9781400060009. 1 2 Downing, David (2009), "Wednesday 19 November", in Downing, David, Sealing their fate: the twenty-two days that decided World War II, Cambridge, Massachusetts: Da Capo Press, p. 48, ISBN 9780306816208. ↑ Frucht, Richard C. (2005), "Cultural development", in Frucht, Richard C., Eastern Europe: an introduction to the people, lands, and culture, Santa Barbara, California: ABC-CLIO, p. 259, ISBN 9781576078006. Preview. ↑ Bendersky, Joseph W. (2007), "The Führer as statesman: ideology and foreign policy", in Bendersky, Joseph W., A concise history of Nazi Germany (3rd ed. ), Lanham, Maryland: Rowman & Littlefield Publishers Inc., pp. 161–62, ISBN 9780742553637. ↑ Norman, Rich (1973), "Yugoslavia: Croatia", in Rich, Norman, Hitler's war aims: the establishment of the new order, New York: W.W. Norton & Company Inc., pp. 276–277, ISBN 9780393055092. ↑ Davies, Norman (2008). Europe at War 1939–1945: No Simple Victory. Pan Macmillan. pp. 167, 209. ↑ Beaglehole, Ann (13 July 2012). "Story: Immigration regulation – 1881–1914: restrictions on Chinese and others". teara.govt.nz. Te Ara – Encyclopedia of New Zealand. ↑ New Zealand Parliamentary Debates, 14 September 1920, p. 905. ↑ Quoted in Stuart William Greif, ed., Immigration and national identity in New Zealand: one people, two peoples, many peoples? Palmerston North: Dunmore, 1995, p. 39. ↑ "Cosme and New Australia colonies". National Library of Australia. Retrieved 2006-07-27. ↑ Eric Campbell (September 26, 2006). "Paraguay Aussies". Final Story, Series 16, Episode 12. ABC Television. ↑ Paraguay Aussies - Peru. Journeyman Pictures / ABC. September 26, 2006. ↑ Western, J. (June 2002). "A divided city: Cape Town". Political Geography, Special Issue Dedicated to Saul B. Cohen. Elsevier. 21 (5): 711–16. doi:10.1016/S0962-6298(02)00016-1. ↑ "From the Western Areas to Soweto: forced removals". Archived from the original on 17 January 2008. Retrieved 7 January 2008. ↑ "Toby Street Blues". Time Magazine. 21 February 1955. ↑ Martin Meredith (1 April 2010). Mandela: A Biography. Simon and Schuster. p. 95. ISBN 978-1-84739-933-5. ↑ Suzman, Helen (1993). In no uncertain terms: a South African memoir. Knopf. p. 35. ↑ Devos, Thierry; Banaji, Mahzarin R. (March 2005). "American = White?". Journal of Personality and Social Psychology. American Psychological Association via PsycNET. 88 (3): 447–66. doi:10.1037/0022-3514.88.3.447. PMID 15740439. Pdf. ↑ Pegram, Thomas R., One Hundred Percent American: The Rebirth and Decline of the Ku Klux Klan in the 1920s (2011), pp. 47–88. ↑ Jackson, Kenneth T., The Ku Klux Klan in the City, 1915–1930 (Oxford University Press, 1967; 1992 edition). ↑ Lay, Shawn. "Ku Klux Klan in the Twentieth Century", The New Georgia Encyclopedia (Coker College). ↑ Zeskind, Leonard (2009). Blood and Politics: The History of the White Nationalist Movement from the Margins to the Mainstream. Macmillan. pp. 535–38. ↑ Welton, Benjamin (2016-02-01). "What, Exactly, is the 'Alternative Right?'". The Weekly Standard. Retrieved 2016-02-05. ↑ Hadjor, Kofi Buenor (1995). Another America: The Politics of Race and Blame. Haymarket Books. p. 100. ISBN 1-931859-34-5. ↑ Caliendo, S.M & McIllwan, C.D. (2011). The Routledge Companion to Race and Ethnicity. Taylor & Francis. pp. 233–35. ↑ Swain, Carol M. (2002). The New White Nationalism in America: Its Challenge to Integration. Cambridge: Cambridge University Press. p. 16. ISBN 0-521-80886-3. ↑ McConnell, Scott (August–September 2002). "The New White Nationalism in America". First Things. ↑ "BNP: A party on the fringe". BBC News. August 24, 2001. Retrieved 2008-02-14. ↑ Boler, M., Digital Media and Democracy: Tactics in Hard Times, (MIT Press, 2008) pp. 440–43. ↑ "Council of Conservative Citizens". Anti-Defamation League. 2005. Retrieved 2008-02-14. ↑ "National Alliance". Anti-Defamation League. 2005. Retrieved 2008-02-14. Josey, Charles Conant (1983) . The Philosophy of Nationalism. Washington, DC: Cliveden Press. ISBN 1-878465-10-4. Levin, Michael E. (1997). Why Race Matters: Race Differences and What They Mean. Westport, CT: Praeger Publishers. ISBN 0-275-95789-6. McDaniel, George (ed.) (2003). A Race Against Time: Racial Heresies for the 21st Century. Oakton, VA: New Century Foundation. Ankerl, Guy (2000). Coexisting Contemporary Civilizations,. Geneva, INUPRESS. pp. 150–56. ISBN 0-9656383-2-4. Robertson, Wilmot (1981). The Dispossessed Majority. Cape Canaveral, FL: Howard Allen. ISBN 0-914576-15-1. Robertson, Wilmot (1993). The Ethnostate. Cape Canaveral, FL: Howard Allen. ISBN 0-914576-22-4. Swain, Carol M. (2003). Contemporary Voices of White Nationalism in America. New York, NY: Cambridge University Press. pp. 312 pages. ISBN 0-521-01693-2.